In the early to mid ’70s, Youngstown State University’s Major Events Committee made a significant push in getting big time concerts to Beeghly Center. 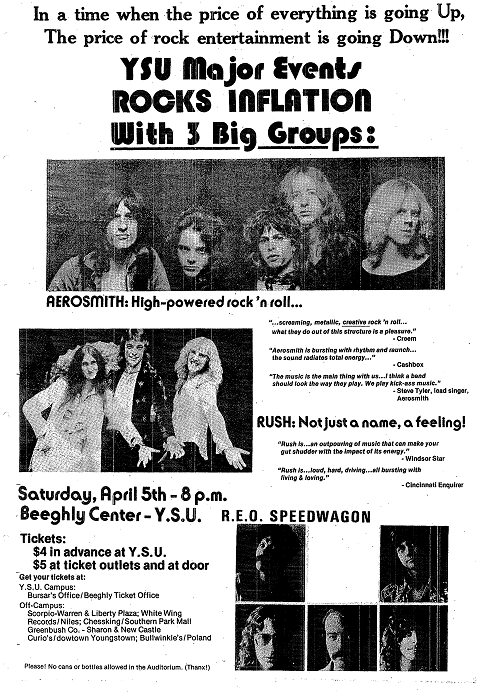 Perhaps the biggest of them all was on April 5, 1975 when headliners Aerosmith joined Rush and REO Speedwagon for a gig that was just $4 in advance or $5 at the door. Only problem was it didn’t happen as scheduled. The April 5 show was canceled due to an injury of an Aerosmith lead guitarist Joe Perry. It was reported that he fell off the stage and injured his face. This would be an excuse Aerosmith would use to justify canceled shows for the next 35 years. The show was somehow rescheduled in quick order for April 13. REO Speedwagon was dropped and locals Blush Ash added. Aerosmith was touring in support of Toys in the Attic which was released on April 1. Hit singles “Walk This Way” and “Sweet Emotion” from that album were a few months from being released as singles, but the band was quickly approaching superstar status at that point in its career. Rush was playing in support of the Fly by Night album, the first recorded with drummer Neil Peart. According to what I’ve come across researching items for this blog, this is the first show in Youngstown for the band. There is no mention of this show on any Rush tour database online. The same goes for the Aerosmith listing. As a side note, the concert lost between $300 to $700 according to articles written in The Jambar during that era. There would be more money losing shows during that period and a consistent stream of big concerts at YSU would all but dry up by the time the ’80s rolled around. Interestingly enough, a modern cousin to Major Events exists at YSU to this day although those shows are now held at the Covelli Centre. Note: Reader Terry Schlosser added in the comments that Rush was not a part of the rescheduled show. Instead Pavlov’s Dog was brought in to play.